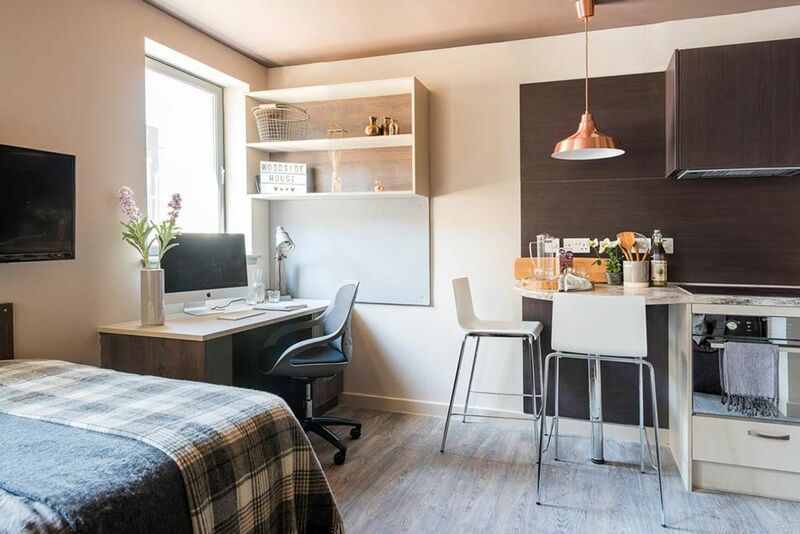 Your student accommodation at Woodside House is in a leafy area of Glasgow’s lively West End, where it’s a short stroll from your studio to Kelvinbridge subway station for easy access around the city at weekends. Relax with a picnic in the beautiful Glasgow Botanic Gardens, a short walk from home, or stroll across Kelvingrove Park to catch the latest exhibition at the stunning (and free) Kelvingrove Art Gallery and Museum. When hunger strikes, enjoy steaming Vietnamese pho (noodles) at the Hanoi Bike Shop, a popular West End haunt, or try the tasty tapas at the Ox and Finch. 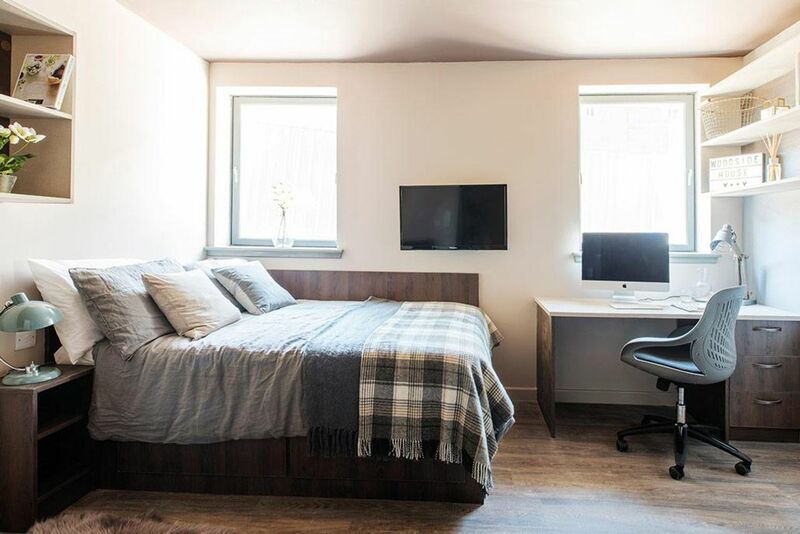 Living at Woodside House, your home is a brand new luxurious studio with a high end finish and tasteful decor where you can live out your student years in style. Wake up each day in a 4ft double bed and get the day off to an active start with a session in the private gym. After that, freshen up in your ensuite bathroom and make yourself a cup of coffee to sip at the breakfast bar. When it’s time for your first lecture of the day, it will take you just 14 minutes to walk to the University of Glasgow, or you can hop on the subway from nearby Kelvinbridge station to get to Glasgow Caledonian University in 15 minutes. When you get home to Collegiate Woodside House after a busy day of lectures, grab one of the study rooms and get started on your next uni assignment. You’ll also have latest generation Wi-Fi in your studio apartment if you’d rather study in the privacy of your home, where there’s plenty of room on your desk for all your notes and textbooks. When you need a break from your books, meet your friends in the glass-walled Sky Lounge and chill out with stunning views of Glasgow. In the evening, whip up a delicious meal in your fully equipped designer kitchen and treat your mates to your creation in the dinner party room. 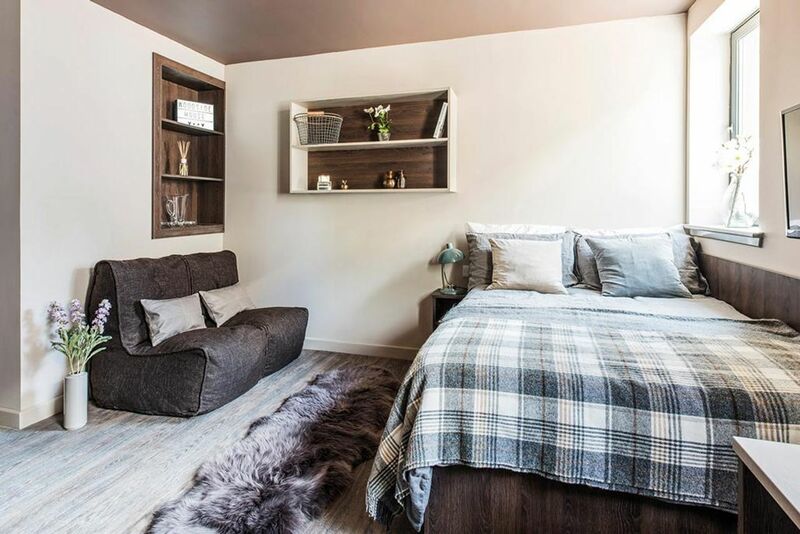 Then settle down in one of the TV snugs or in front of your own 32-inch flat-screen TV to catch up on your favourite shows before bed. 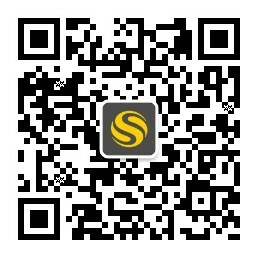 Alternatively, grab some popcorn and head to the on-site cinema room to watch a movie. Early Bird Offer!Book Now and get £400 off your Rent! We couldn't find a room that matches your preferencesView all Entire Place in Woodside House.